Happy New Year! As this is Historicalness.com’s first post for 2012, I thought we’d kick off the year with a little known fact about one of New York’s most important residents. For those of you who have seen old photos of Madison Square Park, you may know that in the decades around 1900, there were a number of temporary arches erected around 5th Ave and 24th street, to commemorate various events, including one put up in 1889 to celebrate the centennial of Washington’s inauguration and which served as a bookend to its sister arch half a mile south on the north end of Washington Square Park. 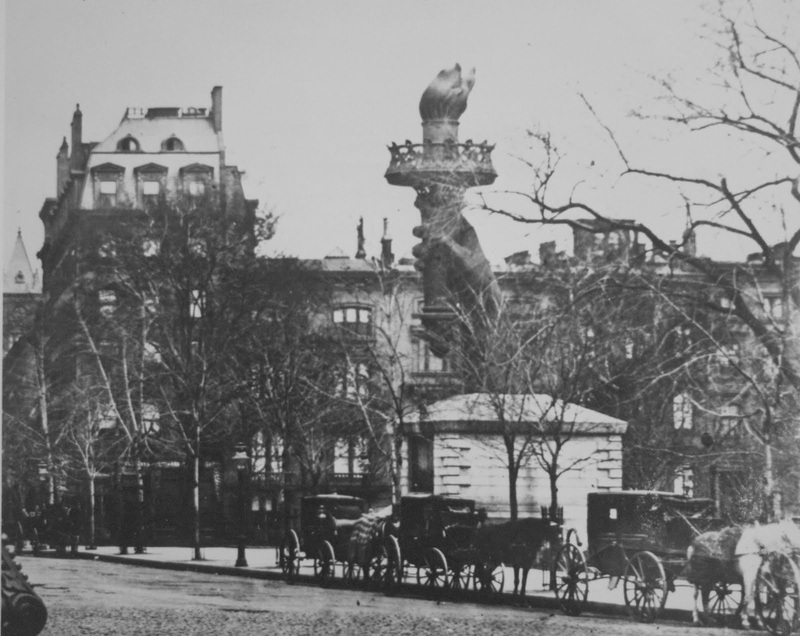 What you might not have seen are photos of New York’s most famous lady, the Statue of Liberty — well, at least her hand and torch — which resided on the western edge of the park from 1876 to 1882. At the time, only the statue’s arm and head were completed, and funds were needed to finish the rest of Lady Liberty (France’s financial responsibility), plus the pedestal she was to stand on (America’s financial responsibility). There's that torch. At Madison Square Park, view looking north up 5th Avenue. By 1882, enough funds had been raised in France for completion of the remainder of the statue that the hand and torch returned across the Atlantic for a trial construction of the whole shebang (although she would need to disassembled for her final trip back to New York). But by the same year, America still hadn’t raised the funding for the pedestal. It was only after Joseph Pulitzer, publisher of New York’s World newspaper, spearheaded a mass public campaign for donations (80% of contributions were less than $1), that funding was secured. Finally, in October 1886, the statue was dedicated on Liberty Island. So next time you’re in the Madison Square Park area, take a minute to walk by the Statue of Liberty’s original New York home.